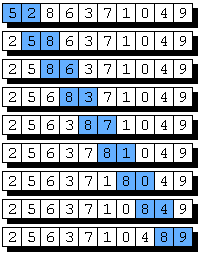 Bubble Sort is a very very basic sort. Each element is compared to the one next to it, and if they are out of order, swapped. The list is traversed in this manner as many times as needed until sorted. Bubble Sort has a worst case of O(n2) (although each traversal the list becomes one element shorter, as the biggest always bubbles to the top and is hence sorted). It has a best case of O(n), as if the list is already sorted (no swaps are made) it early exits. (There's actually a more efficient version; cocktail sort where the smallest and biggest element are shifted appropriately each time). // We access i+1, so we need to stop i at one before the end.